I subbed soft goat cheese for the cream cheese in the original recipe and used duck eggs rather than chicken eggs for the cake in the picture: 12 ounces of duck eggs equal 6 large chicken eggs. The cake didn’t rise quite as much, but it was still good and not a problem for those who are allergic to the A1 beta casein found in most cow’s milk cheese and to chicken eggs. Preheat oven to 350º F. Grease a 9-inch round cake pan, line with a circle of parchment paper, and grease the paper also. Dust with coconut flour and tap out the excess. Cut kumquats in half and pull out and discard the pulpy center. Chop the peel and set aside. Alternately, use 2 tablespoon orange or lemon zest. 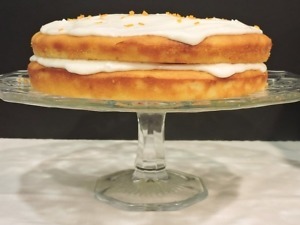 Put almond flour, coconut flour, erythritol and/or any other dry sweetener, kumquat peel or citrus zest, baking powder, and salt in food processor. Process for about 2 minutes until well mixed and erythritol, if using, is very finely ground. Alternately, grind erythritol in a spice or coffee grinder and whisk with flours, baking powder, and salt. Reserve. Beat the butter and cream cheese with an electric mixer until fluffy. Add one egg and beat until incorporated. Blend in extracts and any liquid sweetener. Sprinkle xanthan gum over butter mixture, a little at a time, and beat in. Add remaining eggs, one at a time, alternating with reserved flour mixture, and beating until smooth after each addition. Beat for an additional minute. Scrape batter into prepared cake pan and level the top. Bake at 350º F for 45 to 55 minutes or until golden brown and a wooden pick inserted near the center tests clean. Set cake on a rack to cool for 10 minutes. Run a knife around the edge to loosen. Turn cake out of pan and place, right-side-up, onto a cake rack. Leave until completely cool. 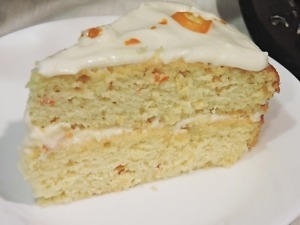 Top with Kumquat Frosting. Sweeteners and optional items are not included in counts. Cut kumquats in half and pull out and discard the pulpy center. Chop the peel and set aside. Alternately, use 1 tablespoon orange or lemon zest. Beat butter and cheese until smooth and fluffy. Slowly blend in sweetener and salt with a spatula at first (so it doesn’t fly all over) then beat until smooth. Add cream and extracts and beat until it reaches spreading consistency. Use more liquid if you want a pourable glaze. Spread over cake. Sprinkle chopped kumquat peel over frosting. Double the recipe for a 2 layer cake and use half as filling. Nutrition Data per each of 10 servings, frosting only. *Erythritol comes in granular or powdered form. If using the granular in baked goods, you need to grind it to a powder first because it does not dissolve easily. If you use a powdered sweetener, like Swerve or Sweet Perfection, you do not need to grind it. calories or carbs, unlike most of the other sugar alcohols, however, it has two significant disadvantages. First, it has an odd, cool taste if used in quantity. Second it has a tendency to recrystallize, producing a grainy texture. Using a second sweetener, such as stevia, to reduce the amount of erythritol, helps. Citrus zest, Cream Cheese Frosting, Kumquats, Yellow Cake. Bookmark. Thanks for sharing this great recipe. Tried it and it was delicious! Thanks, Tom! So glad you liked it.